Have been off the radar a little from everyone, everywhere and everything so apologies for that but I have had some time to recoup, regroup and regenerate… all positive steps! 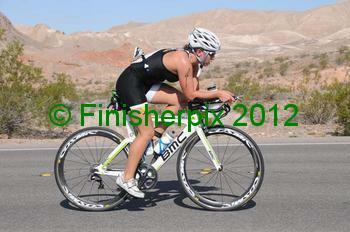 On September 9th 2012, I competed at the 70.3 Ironman World Championships in Las Vegas, my (now) home turf. A new distance to me this year and one I only started training for in May, when I moved to Las Vegas and signed up for the 70.3 Wisconsin. Now I did qualify for the World Duathlon Championships in Nice, back in March but Triathlon was still my focus and qualifying for World Triathlon Championships. Albeit I was still at this point thinking of the Age Group Olympic distance – 1500m Swim/42km Bike/ 10km Run – but with the move to the USA I was unable to race at any qualifying events. 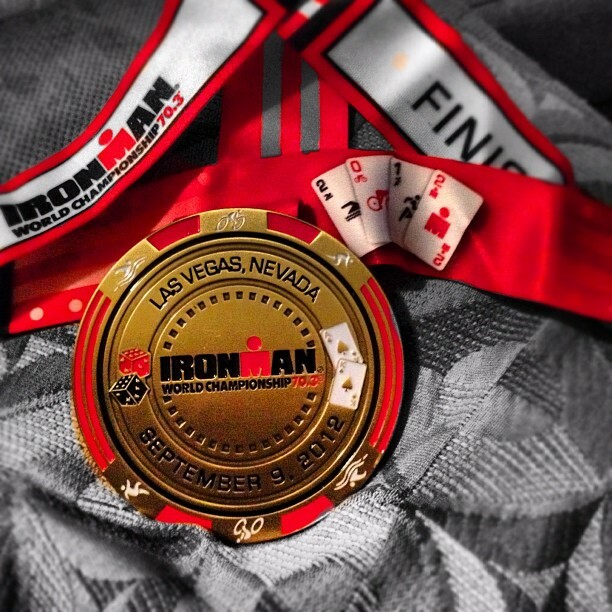 So, after moving here I signed up for half ironman to see if i could somehow qualify for Worlds, knowing the half ironman championships were in Vegas. With a great swim and bike leg, and half decent run considering I heat stroke, I managed to qualify for the World Championships- GOAL ATTAINED. Now fast forward back to the 9th September…. The day was hot by the time the sun was rising and I was wave number 15 starting at 7:50am. The weather forecast had said it would be cloudy and a cool 80-ish degrees Fahrenheit. Of course this was too good to be true…there was not a cloud in the sky and the temp was closer to 100degrees if not higher at times. The race began as a deep water start with over 100 of us treading water over the starting line. And we’re off! At least 5 hits to the face, a couple kicks and a few gulps of severely questionable water and I completed the 1900m swim through Lake Las Vegas. The swim for me is my weakest aspect of the Triathlon and I just focus on getting through it so I can really begin my race! True to form I came out of the swim quite far down the field but exited the water to transition and had a reasonably slick transition. I headed out onto the bike to grind through the 56miles of desert in the scorching heat. My nutrition here was almost spot on; I alternated with one bottle of electrolytes then one bottle of water, consuming approximately 5-6 bottles throughout the bike course. I had my EFS gel bottle which I consumed throughout the bike also – this was a brilliant find brought to me by Lelani at Pro Cyclery. Unfortunately I had a couple hiccups on the bike…. I vomited a couple times (probably the questionable water) and also received a yellow card, I presume for drafting. This is something I don’t agree with as I was overtaking up a hill at the time but you can’t argue with the ref and you’re just as well taking the hit and getting on with the race and just hope that the people that really ARE drafting also get penalised! And breathe… Anyway, I reached T2 and passed my bike to one of the volunteers before running through to pick up my run kit – the organisation at this event was truly amazing, and even more amazing were the hundreds of volunteers who were out supporting us throughout the day! I spent a couple minutes in the transition tent putting on my shoes, getting lathered in sunscreen and drinking an ice cold water before heading out into the unforgiving heat. The run course was a gruelling 3 lap course consisting basically of 2 and a bit miles uphill and 2 and a bit miles downhill… in the unrelenting heat… By this point I was feeling the exhaustion of the heat starting to take over. This is a strange feeling because my legs felt ok but my body was suffering. The race became a case of getting from one aid station to the next. The focus was simply to finish. 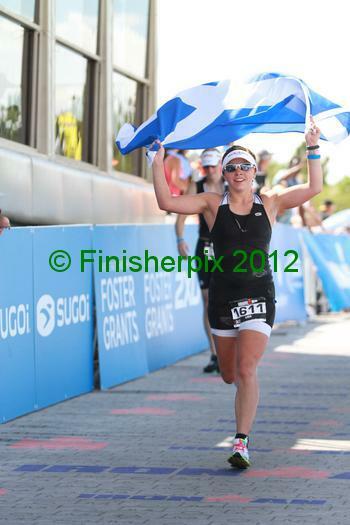 Sometimes you have days when you know you’re on for a PB/PR but that day it was simply about crossing that line. 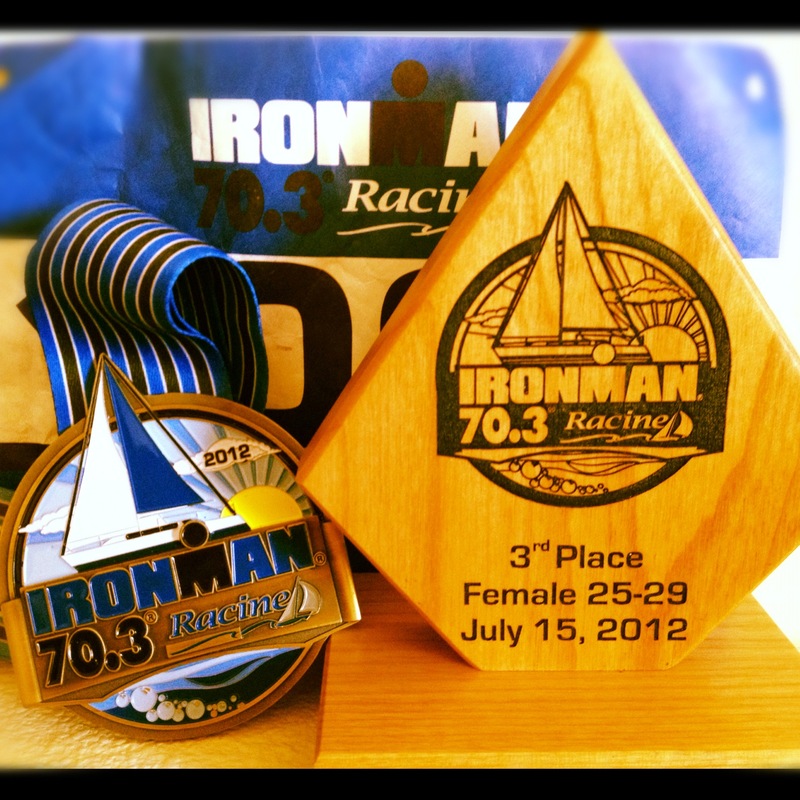 Something that was really special for me was having so much personal support on the race course. My running team mates from Ninja Endurance Racing, my Sponsors from Pro Cyclery and my friends from Work at Healthsouth plus other friends that I have met through cycling, running etc since I have moved here. On reflection this really was all I needed. I had achieved my goal of qualifying but more than that I had successfully started a new life in a foreign country, a move that was scary and full of unknowns but I really feel lucky to have met and become friends with all these people. These people cheered me on through the 13.1 mile run and handed me the Scottish flag so I could fly it home over the finishing line. Running down towards the finishing line, I sported the biggest smile because I knew how much I had achieved, how far I had gone, just to cross that line. Not just on the 9th September but over the past few months. This was a mental and physical battle of will, heart and determination. And I did it. So this is a thank you to everyone who helped me to cross that line. Post race I had a bit of post race/post season blues. I didn’t want to talk to anyone about the race or think about running or cycling or swimming or training of any kind. I had alot of personal and emotional issues built up from the preceding months and the stress of moving, starting a new job, training for such a big event hit me hard. I escaped with a couple friends away to the beach and it was just the therapy and getaway I needed. Floating effortlessly in the Pacific ocean with the water covering your ears so you can’t hear a thing, feeling the water just soothe your troubles away is something that everyone should experience just once. I took another week after that to chill out with little to no training involved at all. Trying to figure out what and where I wanted to go from there. And now, this week (now Tuesday) I feel I am on my way towards new goals, a new season (after a productive and smart off season of course) and hopefully some better times ahead. As I have been out the loop please feel free to leave comments and tell me what inspires YOU, what YOUR long term goals and dreams may be?